Just curious what sort of colors were you looking for? This is really awesome! I'm absolutely loving the colors and textures and patterns and the vectoring is really cool. Nicely done! I wonder how you think of such a creative bg. Great job on the vector and everything! Personally I think it's a little too much going on in this wallpaper, while it's done VERY well. I don't really know where to look, but if it was like a poster or something, I'd say it would be fine. Nice piece of work though, keep up the excellent vectors and designs. Ahhh... Emma spoiling for me! I just can't get enough of walls from her. Errr... anyways, I love the colors you used on this and the polaroid frame (a very nice touch ;)). The fill texture you used for the hair at first felt a bit odd but as I look at it I enjoy it more and more. However I do agree with Devilet that this seems to have so much things going on, I would have preferred it a less busy. But the work you've done is technically good. Very nice. 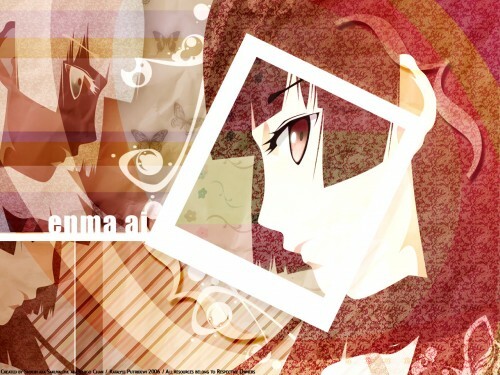 The not-quite-pop look suits Jigoku Shoujo surprisingly well; especially like the wacky swirls. Anyway, whether its pop or not this wall is eye-catching. its really detailed must have taken u ages! PS -can't highlight coz you've already had a highlight in the last 30 days. <_< Oh well, I'll just paste my highlight comment here ne? The blend of patterns and abstract style adds an interesting combination of style and effects. But they're not everything in this wall. There's much more - flawless vector work, original layout, unique cropping and vibrant colour work. They intertwine together and produce this wonderful wallpaper you see here. Wonderful wallpaper ShiXon. cool man ! its lyk the wallie is giving me 'the' aura of something ! err.. u dont lyk the colour ? well 4 me me love it ! n great style ! cool! it a nice idea and i like the patterns. i love how you designed this wall.